The Olympic fencing tournament was thrown into an incredibly emotional, dramatic and elongated controversy when a semifinal bout of the women's individual epee competition was won on a final touch with 1 second remaining and the losing fencer launched an appeal of the decision which eventually cost her a place on the podium. With time running out in one of the two semifinal matches for the women's individual epee competition, South Korea's Shin A Lam led Germany's Britta Heidermann by a single point. Officially, Heidermann had just one second to launch an attack and score a touch, which would advance her on to the gold medal match to face the Ukraine's Yana Shemyakina, a lack of time which all but ensured that Shin would advance. Instead, the timing mechanism on the piste became stuck, giving Heidermann extra time to complete her attack and win the bout, which earned her the spot in the gold medal bout. Officials, unsure what to do without a true, official protocol to follow, eventually decided to award the victory to Heidermann. As one might expect, Shin and her coaches were enraged with the decision, and launched an immediate appeal. Yet the appeal itself proved to be incredibly lengthy and also contained a unique bylaw that required Shin to remain on the piste throughout its duration. Unable to leave the playing surface, Shin bawled uncontrollably for the first 10-15 minutes, often shading her head in a towel while occasionally looking out to the crowd before rubbing her eyes again. At long last, after more than 30 minutes of a delay that included the Korean federation having to expedite a payment for the use in the official appeal, Shin's attempt to overturn the result failed. That brought a crushing end to a ridiculously long period marked by piquant discussion between Olympic and Korean officials and occasional announcements trying to explain what was going on to the spectators in the crowd. Clearly, Shin should have had a chance for the gold medal; if the timing mechanism didn't get stuck, the clock would have run out and she would have advanced. Yet denying Heidermann a shot without some kind of a playoff-style bout might have been equally cruel. Either way, the fencing tournament somehow ended up with an unfortunate and completely unforeseen loser which will lead to plenty of gripes and arguments going forward from multiple national federations, to be sure. 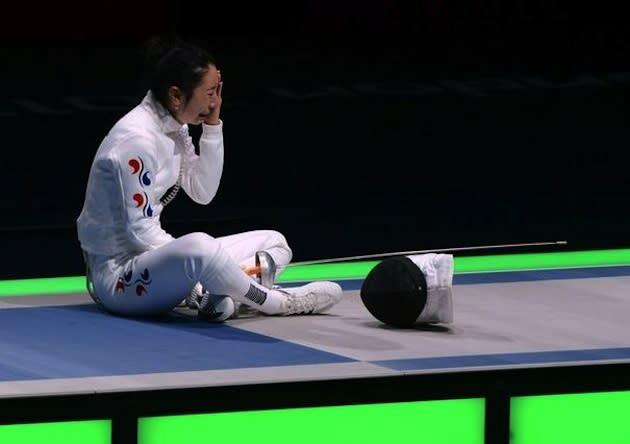 Just to rub salt in the wound, Shin was forced to come back out and fence for the bronze medal almost immediately. In that bout, after jumping out to an early lead, the Korean fell to China's Sun Yujie, who claimed the bronze by a score of 15-11. There was little consolation for that result for Shin, particularly after she quite rightfully should have been fencing for a gold medal, a position which would have guaranteed her at least a silver. Still, throughout her bout — just as during the delay — the Korean was applauded and cheered by fans, and she earned a rapturous applause as she went and was consoled by her coach after the bronze medal defeat. Somehow, that might not go far enough to making the Korean federation feel better about being royally worked over en route to missing out on a medal.